Is Anesthesia A Luxury During Colonoscopy? : Shots - Health News Anesthesia is being used more often for colonoscopies, even if people really don't need it. People in the Northeast are far more likely to be put to sleep, compared to the West Coast, where insurers are less likely to pay. Is Anesthesia A Luxury During Colonoscopy? 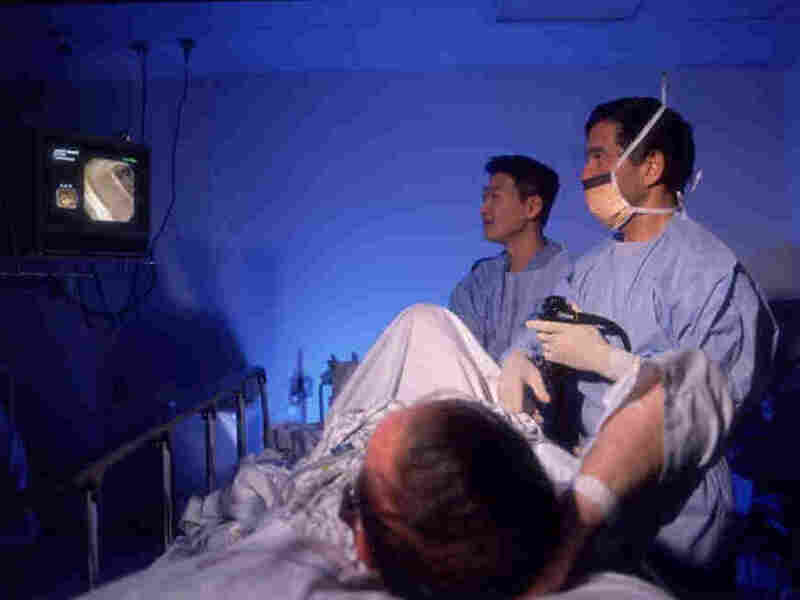 Doctors often let patients decide how much sedation they'd like when they have a colonoscopy. But whether you're put under by an anesthesiologist may depend a lot more on where you live and who gets paid than patient preference, according to a new study. Big bucks are involved. It would cost an extra $8 billion a year if anesthesia services were used for all 20 million endoscopies and colonoscopies performed each year, because an anesthesiologist or nurse anesthetist has to be paid, too. And more and more people are getting anesthesia with that colonoscopy. In 2003, just 14 percent of people had an anesthesiologist or nurse anestheticist, according to the study in JAMA, the Journal of the American Medical Association. By 2009, that number had risen to 30 percent. Most of that increase was for healthy people who don't have a condition that would require anesthesia. People in the Northeast are much more likely to get anesthesia services. That happened 59 percent of the time, compared to 13 percent in Western states, where insurers have balked at paying the extra cost, saying that almost all people do just fine with sedatives administered by the doctor doing the endoscopy. "The financial incentives are a little perverse," says Lee Fleisher, chair of the department of anesthesiology and critical care at the University of Pennsylvania Health System. This isn't a new issue. In recent years insurers have been trying to back off on paying for anesthesia with propofol, a fast-acting drug that usually requires the services of an anesthesiologist or a nurse anesthetist. Gastroenterologists get paid just as much if an anesthesiologist is involved, but since they don't have to manage sedation, they can work more quickly and handle more cases in a day, Fleisher says. They also avoid potential liabilty for patients who might react badly to sedatives. But insurers end up paying for more personnel, and the anesthetic. "We're covering it," says Scot Roskelley, a spokesman for Aetna. The insurer had said it would stop paying for anesthesia back in 2008, but has decided to delay that change indefnitely, Roskelley told Shots. The cost ranges from $150 for people insured by Medicare to $508 for people covered by a private insurer. So in some endoscopy centers, patients are given full anesthesia as a matter of course, even though most healthy patients don't need that much sedation, or that level of monitoring. Medicare covers the costs, as do some private insurers. "The finances have made it easy not to make a difficult decision," Fleisher told Shots. He wrote an editorial in this week's JAMA. So there's a case to be made for insisting that healthy people use moderate sedation rather than being put to sleep by an anesthesiologist, Fleisher says. But there's also a risk that people who are leery of the discomfort of colonoscopy would skip the procedure, increasing their risk of colon cancer. "If we say tomorrow that anyone who is healthy is denied anesthesia, my fear is that people will stop getting their colonoscopies," Fleisher says. In the end, he says, it makes sense that people who do want to have full anesthesia pay a bit more for the service. "If it makes a difference, I'd be willing to pay for that difference. The real question is figuring out a way so that people are using the resources the most rational way."